We left Bimini at 0540 in the dark two days ago on December 29, 2014. The early start is because it is about 80 miles from there to Chub Cay and daylight at this time of year lasts less than 12 hours. We arrived in the dark at 1850. The day couldn’t have been nicer with smooth blue water. I am never sure how to describe the color of this water and often there are various shades in stripes, but I can’t believe there is more beautiful water anywhere. We left Chub Cay at 0805 today and arrived in Nassau at 1415. Again, there was little wind and the seas were smooth. The above photo is on the Banks which are shallow. Today we were back on the deep ocean which is dark blue. 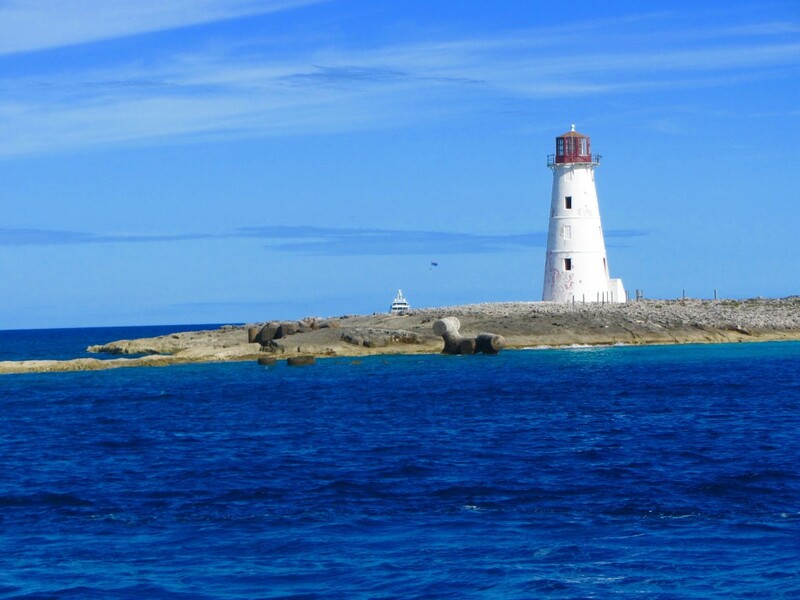 There are several views that always welcome us to Nassau: the lighthouse, the cruise ships, and the Atantis. We don’t really like staying in Nassau because we are anxious to get to the Exumas, but we always stop here for fuel and a night’s stay. 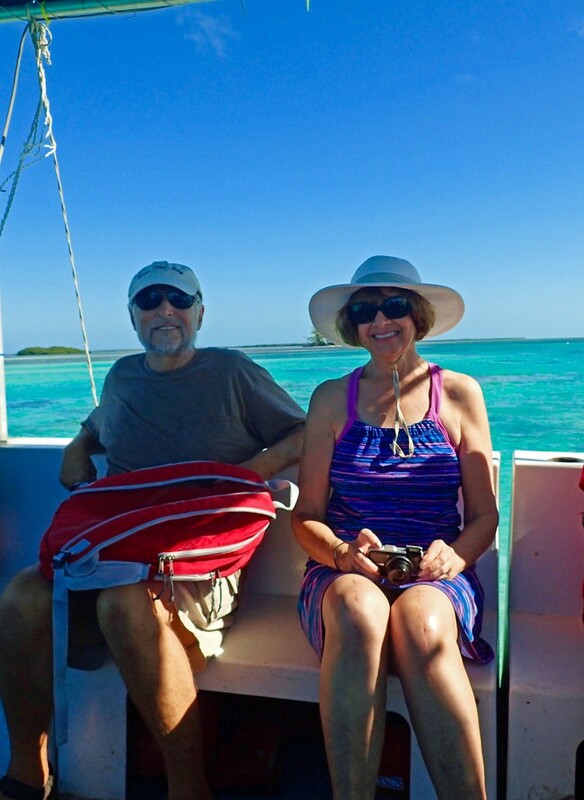 Then we have an easy day’s sail to the Exumas. 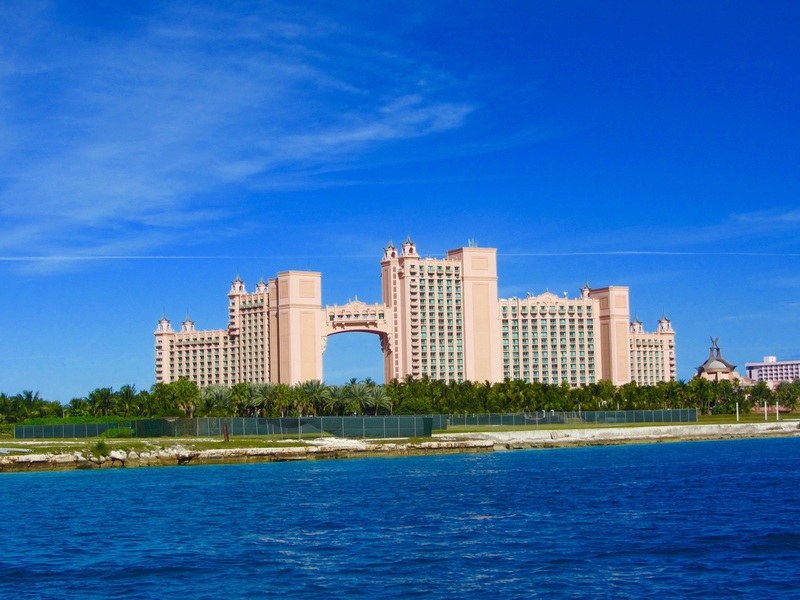 We’ll spend most of our time there on a number of small islands with gorgeous beaches, friendly Bahamians, and of course the phenomenal water. We are staying at the Nassau Harbor Club Marina in Nassau which is across a busy street from a strip mall that includes Starbucks, Fresh Market, a Batelco phone store, and much more. 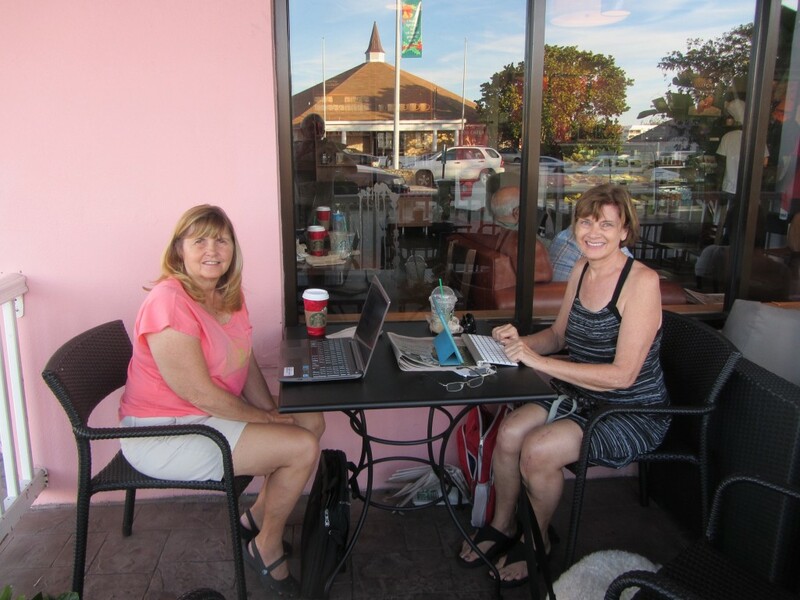 We made our usual stops, first at Starbucks where Cathie (Interlude) and I had our last drinks until we return to the States. We didn’t need much at the grocery store but did purchase a few items since this is the last real grocery store that isn’t in someone’s house until we reach Georgetown. Tomorrow, January 1, is the official start of the 7% VAT in the Bahamas. 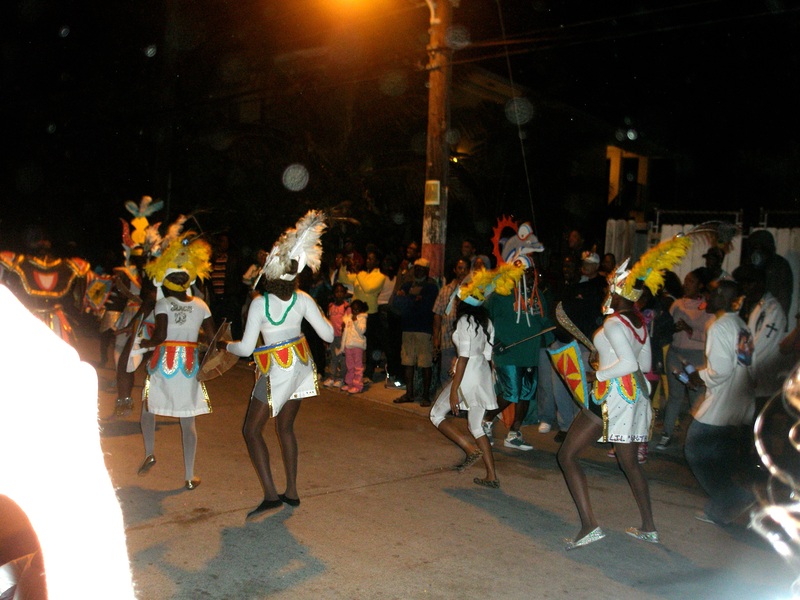 Tonight is a big celebration in Nassau with Junkanoo and fireworks beginning at midnight. 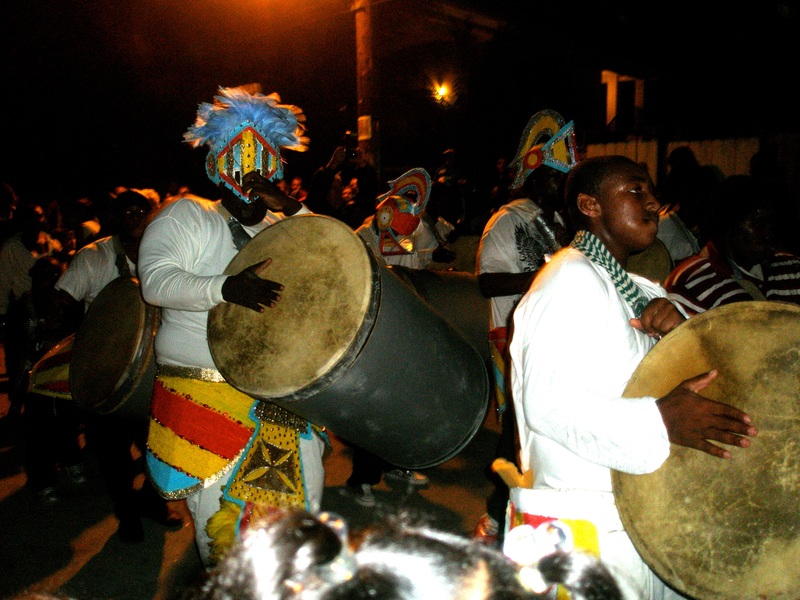 The Junkanoo parades are held on all of the Bahamian islands on Boxing Day, December 26, and New Years Day. 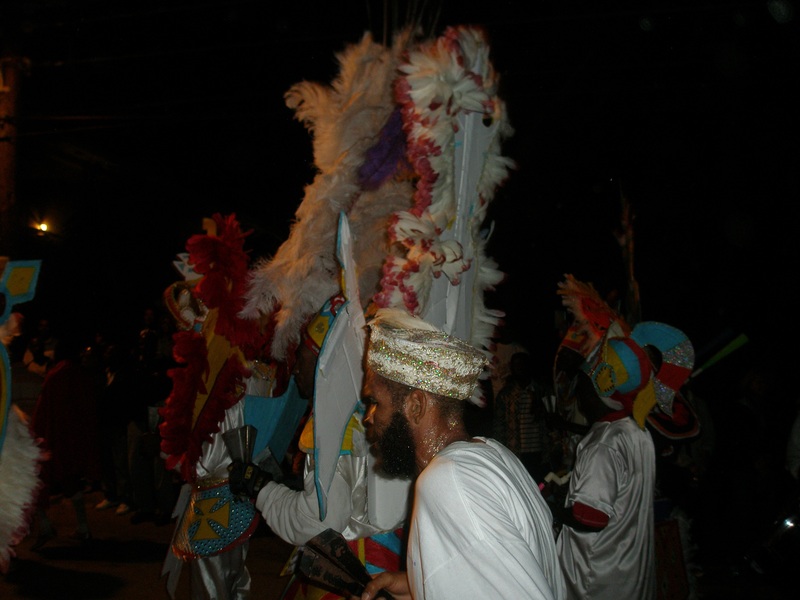 The people dress in colorful elaborate costumes and march to the beat of drums and horns. There is a competition between various groups on each island. We will enjoy a few hours with Cathie and Tom tonight with some wine and snacks, go to sleep, and no doubt be woken up a few hours later when the noise begins. 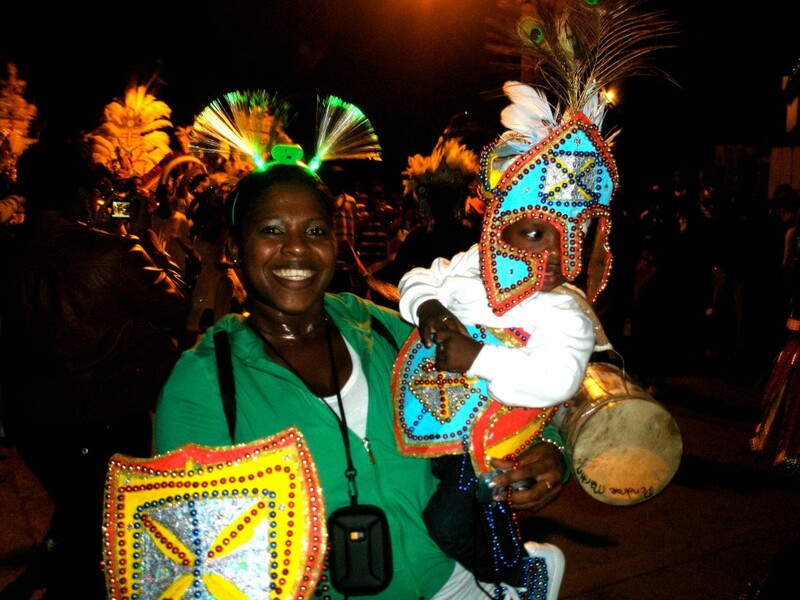 On January, 2010, we were in Bimini for Junkanoo. Below are a few photos of that celebration. 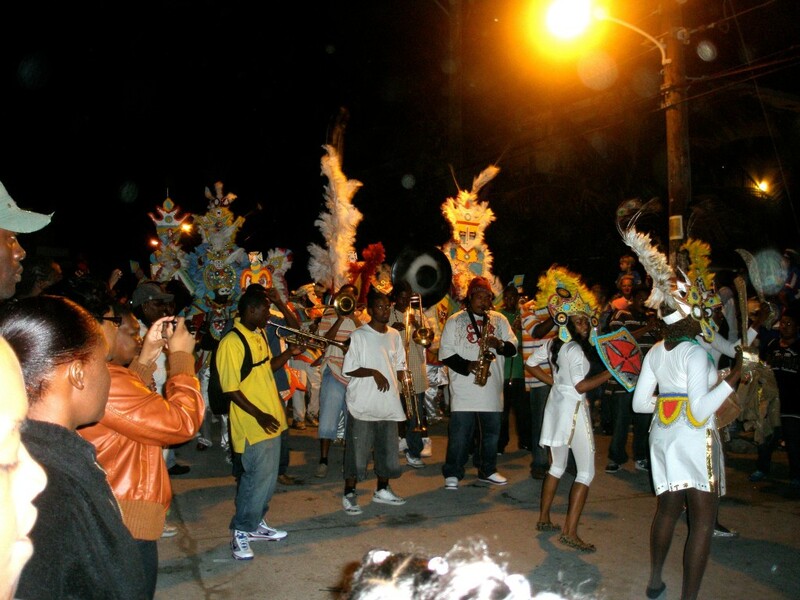 We won’t be out there taking pictures tonight in downtown Nassau! However, we have heard that Junkanoo here is much larger than what is done on the less populated islands. 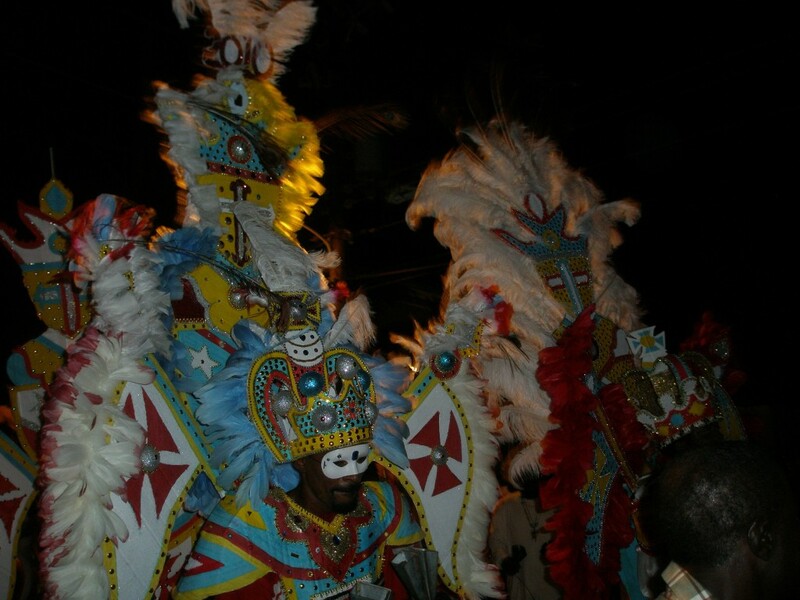 Junkanoo had its beginning during the Bahamian slavery days when the slaves got three days off a year and celebrated by dressing up and partying. This entry was posted in 2014-2015 Bahamas Cruise, Chub Cay, Sailing and tagged Chub Cay, Holidays, Junkanoo, Nassau on December 31, 2014 by Jan. The distance from Miami to Bimini is about 50 miles. We arrived at 1900 on 12/27/14, pulled into a slip and settled in for a few days. The first part of the trip was a little lumpy but about halfway across the seas flattened and it became more comfortable. We were motoring directly into the wind. We have been in Bimini a number of times so we knew the channel into Bimini Sands in South Bimini but they have changed the markers since last year. A new large unlit channel marker went between our hulls and popped out under the dinghy. No damage to the boat, but sure sounded bad! 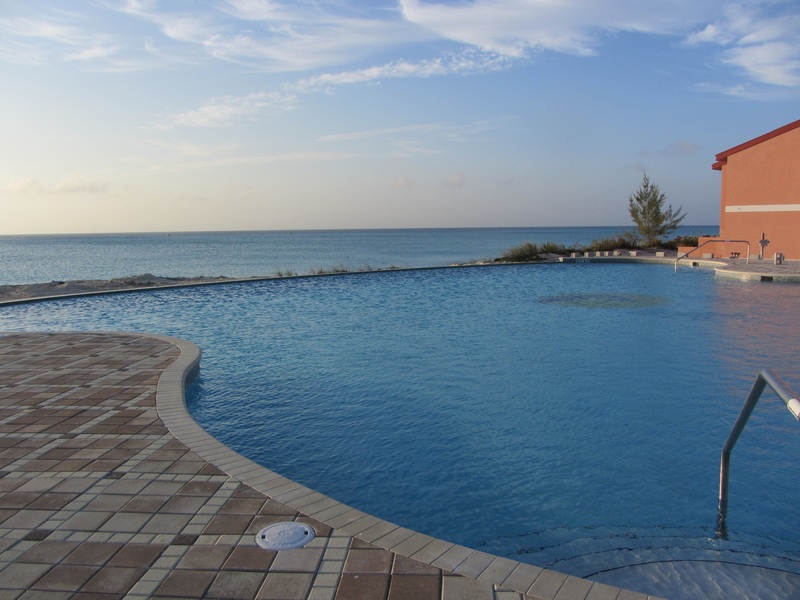 We enjoy Bimini Sands because it is so quiet here and the marina has wide slips and floating docks. It is the only Marina in South Bimini. In the photo below we are between a large powercat and Interlude. There are other marinas in North Bimini, but they aren’t this nice. Also the current is strong at the other marinasmaking boats rock in the slips. Today we watched a sportfisher try 4 or 5 times to get into a slip with a strong current at Big Game Club Marina. 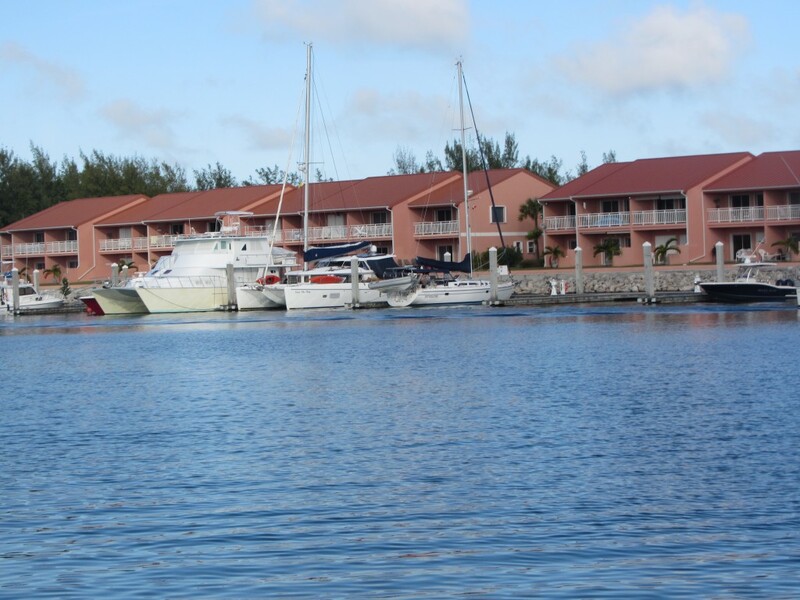 Bimini Sands Marina is surrounded by condos and there are two pools, a tennis court, and several restaurants here. 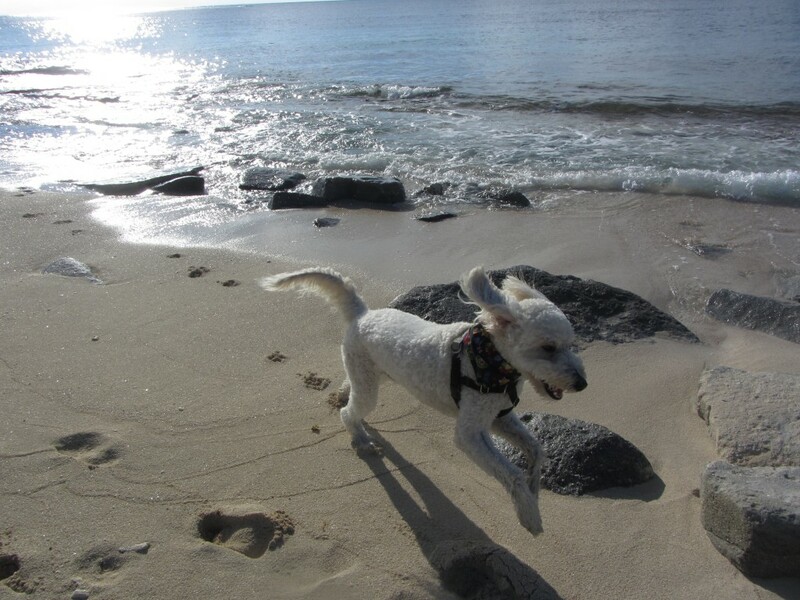 The beach is nice for walking, and Sailor certainly loves running on it. Mark had several jobs to do here. It seems that when we have the mast taken down for hurricane season, there are electrical repairs to make. This time, the anemometer (wind vane) at the top of the mast is not working. Also on the mast, the radar is not getting the information to our chart plotter. 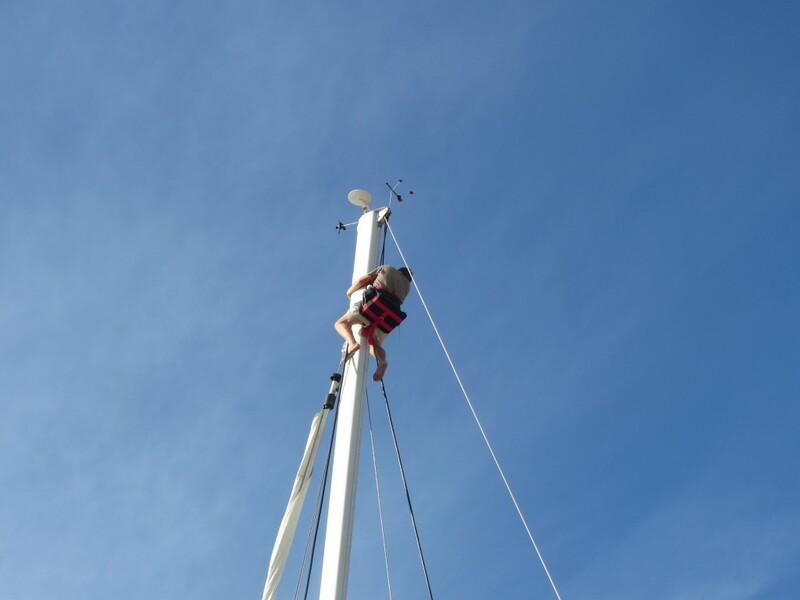 Much to his dismay, Mark had to climb up to the top of the mast to fix them. It is easier to climb a mast at a dock than when bobbing around at anchor. Still not a sailor’s favorite activity. After all this work he couldn’t get either one to work. I’m sure he’ll be back up again, perhaps at our next and last marina in Nassau, until we are headed home in May. 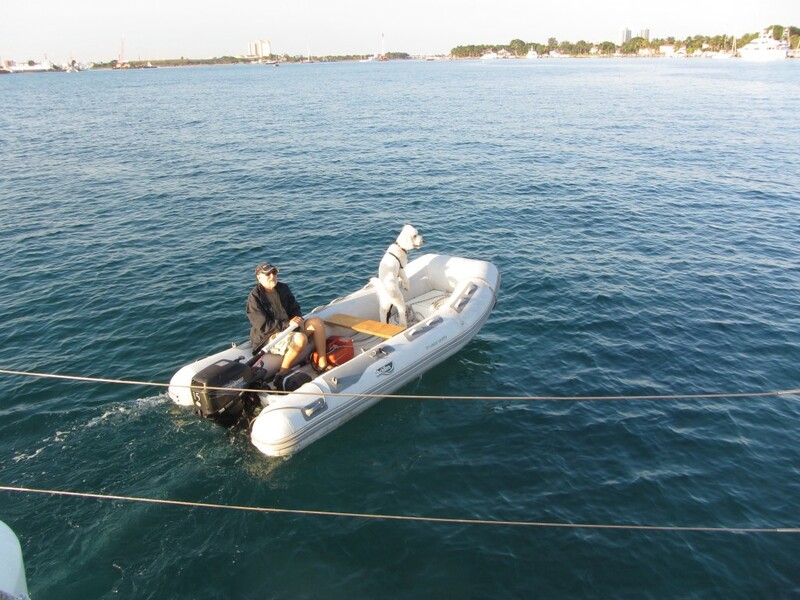 This entry was posted in 2014-2015 Bahamas Cruise, Bahamas and tagged Anemometer, Bimini, Boat Repairs, Weather on December 29, 2014 by Jan.
Monday, as soon as the riggers left, we left Ft. Lauderdale and turned south towards Miami. We tried a new anchorage this year in a small lake near South Beach named Sunset Lake. It is a beautiful area, but a few years ago one of the home owners did not like boats anchored in front of their house. To keep the boats away, they purchased about 20+ small sailboats and anchored them directly in front of their house, blocking regular boats from coming near them. The little boats even have anchor lights. The photo is a little blurry because I had to zoom in from a distance. We spent Christmas Eve and Day on Sunset Lake. Fresh Market was nearby and we shopped for food with friends Cathie and Tom on Interlude. We enjoyed a delicious but easy meal. It was only a few blocks to the shopping area, and naturally there were Starbucks on every corner so I got my last frappuccino before we left Florida. Below are several Christmas photos. Our one year old Christmas cactus bloomed in spite of us not following the watering and light instructions. 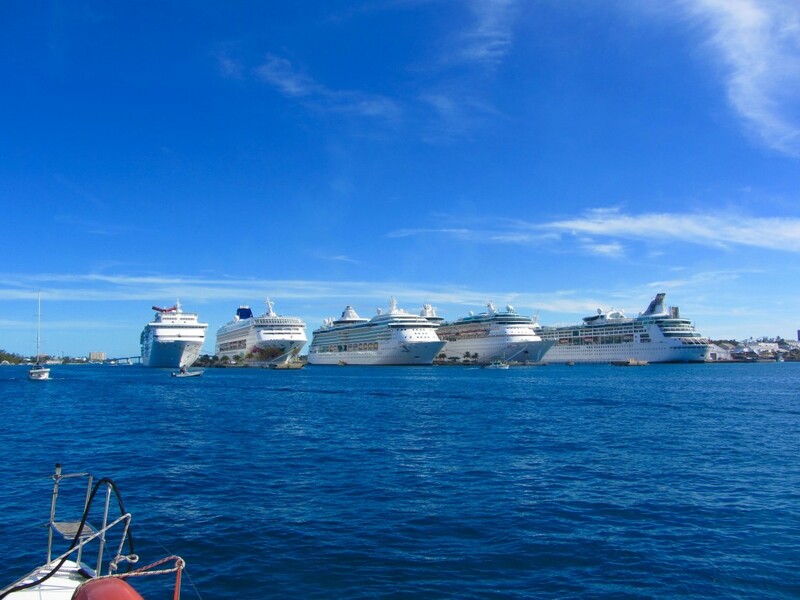 We had planned on leaving for Bimini on Sunday, motoring over to get fuel and stage the boats near the channel by No Name Harbor on Saturday, but when we woke up Saturday morning the weather seemed perfect for a crossing. The winds were SE at 15 kts. We would be motoring into the wind and probably couldn’t sail, but the seas would be calm. We stopped to get fuel and then at 1050 entered the channel to leave Miami. Normally we leave at daybreak, so we figured we would be arriving in Bimini in the dark. 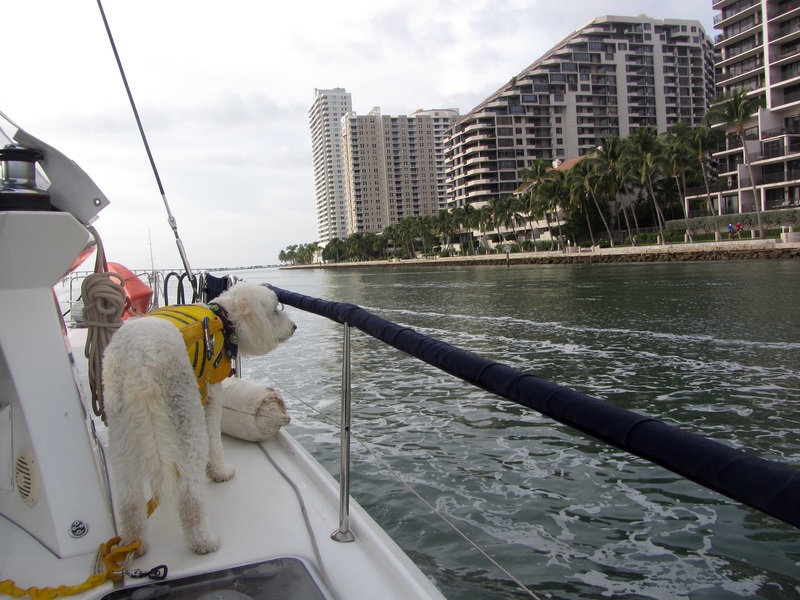 As we went past the Miami skyline, Sailor checked out the buildings and probably hoped for calm seas. 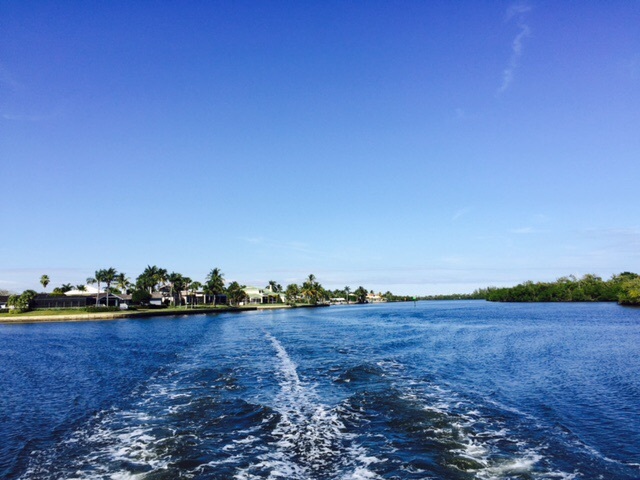 This entry was posted in Crossing, Florida and tagged Holidays, Miami on December 28, 2014 by Jan.
On Saturday, 12/20/14, we hauled the anchor in Lake Worth at 0745 and motored (still without our sails) south on the ocean to Ft. Lauderdale. As is typical in Southeast Florida on a weekend, the ocean was littered with boats, mostly fishing. The combination of them stirring up the water and swells hitting us on the beam made for an uncomfortable ride. From the shore, there were no white caps and the seas were less than two feet so it probably looked like a nice day on the ocean. However, swells hitting us every ten seconds made the boat rock side to side. We were very happy to get into a slip on the New River at 1530, making the cruise 7 hrs 45 minutes. Mark made good use of the time and spent most of Sunday cleaning the very dirty deck. This will be the last time we have unlimited water until we return to the US at the end of May. 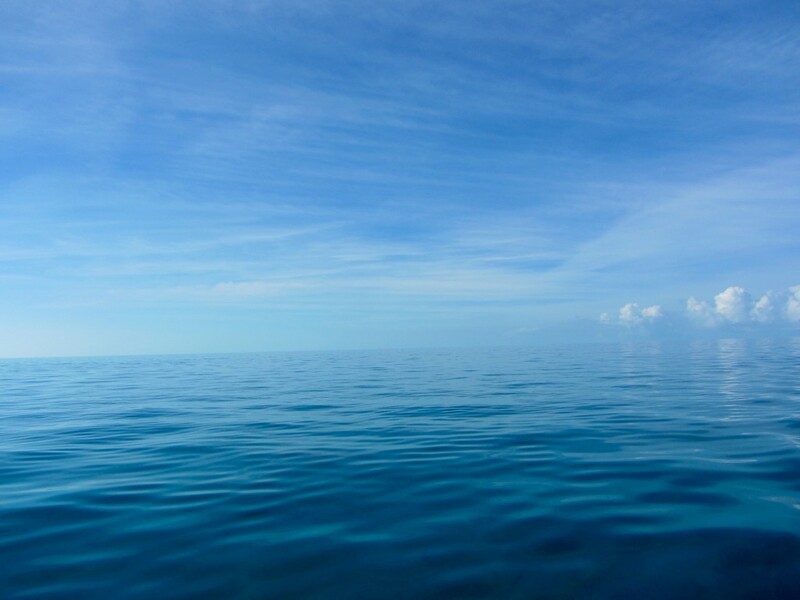 When we clean the boat in the Bahamas, we use salt water and soap to wash it and rinse it with fresh water. We have hoses that dispense salt and fresh water on each sugar scoop and on the foredeck we have a deckwash system with fresh and salt water. Below we are at slip 35 on the New River, just before the 3rd Ave. Bridge which can be seen in the second picture. There are numerous bridges over the New River since it goes right through the city. There is a park next to us and of course we are surrounded by condos and right on the Riverwalk. 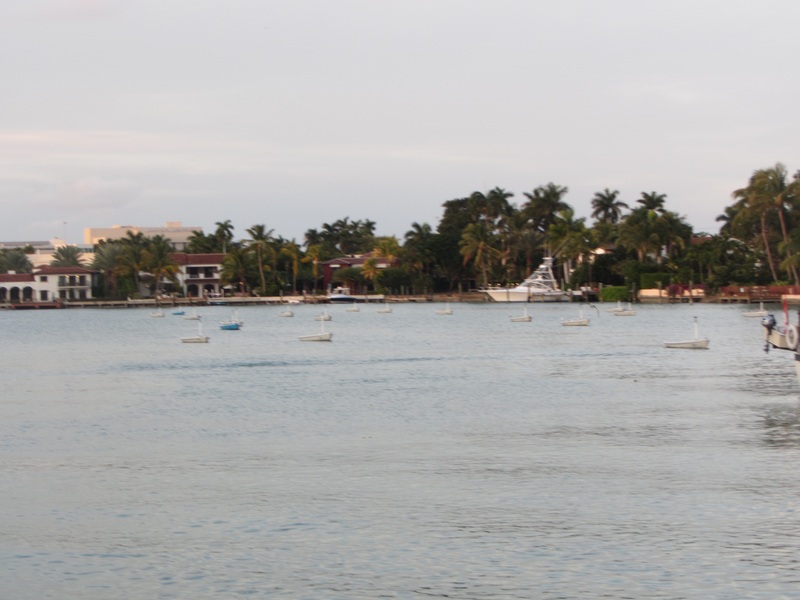 Boats are constantly going up and down the river, from megayachts being towed to the Lauderdale Marine Center for repairs farther up the river to kayaks, powerboats, commerical tour boats, and sailboats. This morning, Monday, 12/21/14, the riggers arrived on time at 1000 with our sails. Two hours later they finished and we left the river to head out on the ocean and SAIL to Miami. Or so we thought. We are headed right into a 17-20 kt wind, thus no sense in raising the sails. Sometimes we rock side to side and sometimes front to back. Not fun, but we’ve been in much worse. The sun is shining and it’s 80 degrees. Today is a short trip, about 5 hours. We are headed for an anchorage in Sunset Lake near South Beach for a few days at least. We’ve never anchored in this area so are looking forward to exloring it. 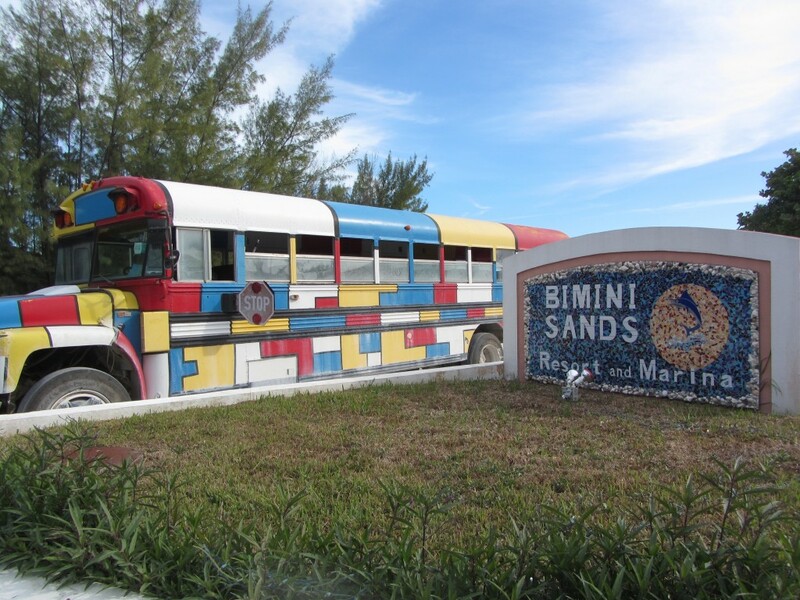 The weather is changing tomorrow and we won’t have a window to leave for Bimini until after Christmas. Today probably would have been a good day to go, and we had planned on it until the riggers forgot to bring the sails and delayed us. However, as always on a boat, plans are written in sand. 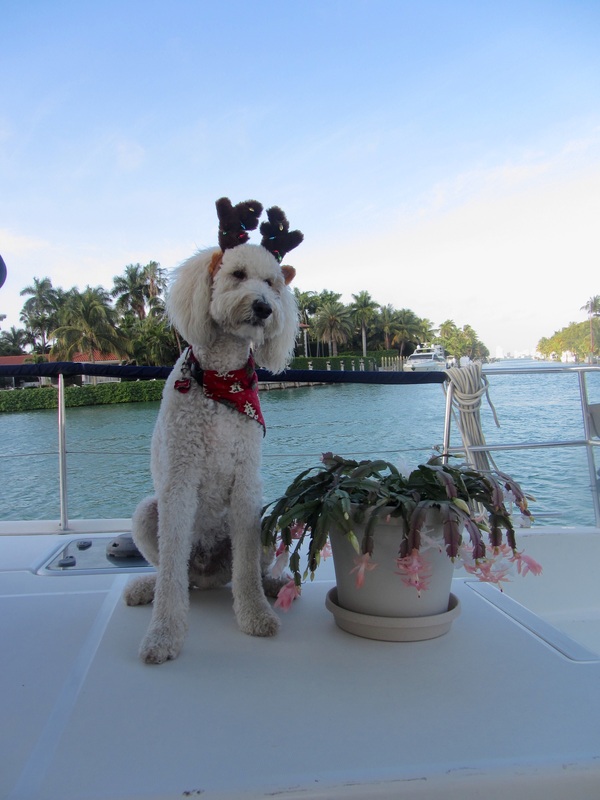 This entry was posted in Boat Maintenance, Sailor Doodle and tagged Ft. Lauderdale on December 22, 2014 by Jan. This morning we motored the short distance from Old Port Cove to Cracker Boy Boatyard. At 1200 we entered the tight slip and the riggers arrived. 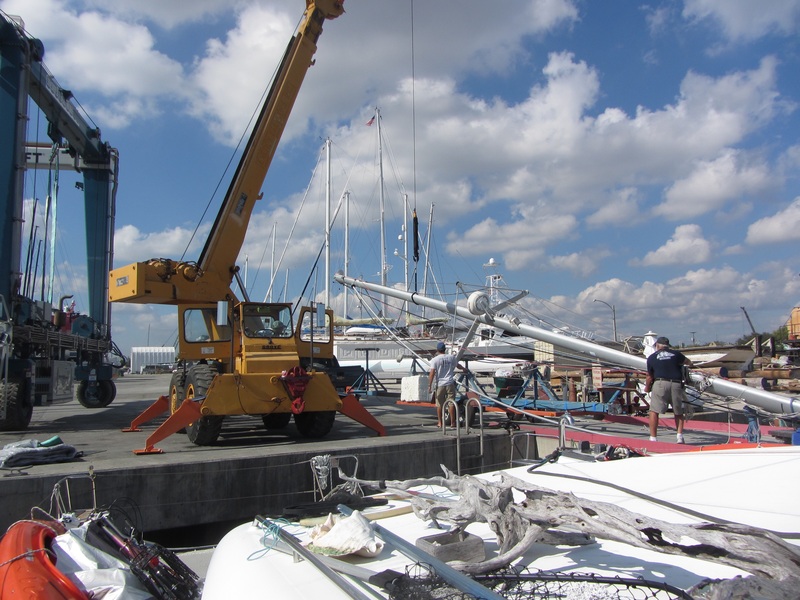 A crane raised our mast and the riggers carefully positioned it back in its place on our deck. Then they asked for our sails. Hmmmm. They had our sails since June stored in their sail loft in Ft. Lauderdale. 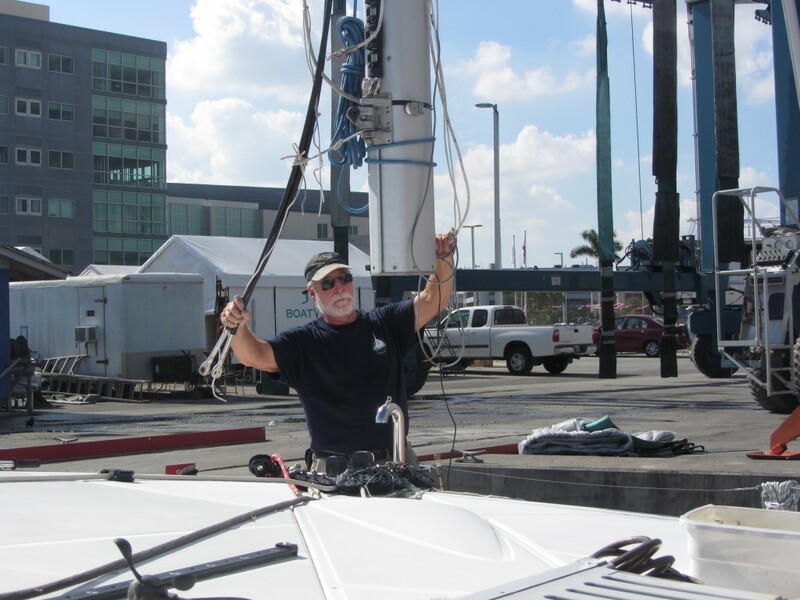 The riggers said they didn’t know that but they could work tomorrow, Saturday, and since we had planned on going to Ft. Lauderdale tomorrow that would work for us. Mark called the scheduler and he said they hadn’t planned on putting the sails back on today because we could only stay in the slip for two hours and they wouldn’t have time to finish. Apparently someone forgot to tell the riggers about the sails and now they are going to pretend this was the plan all along. Very obviously they forgot they had our sails. The workers had already told us they could come to where we will be in Ft. Lauderdale tomorrow and put the sails on. 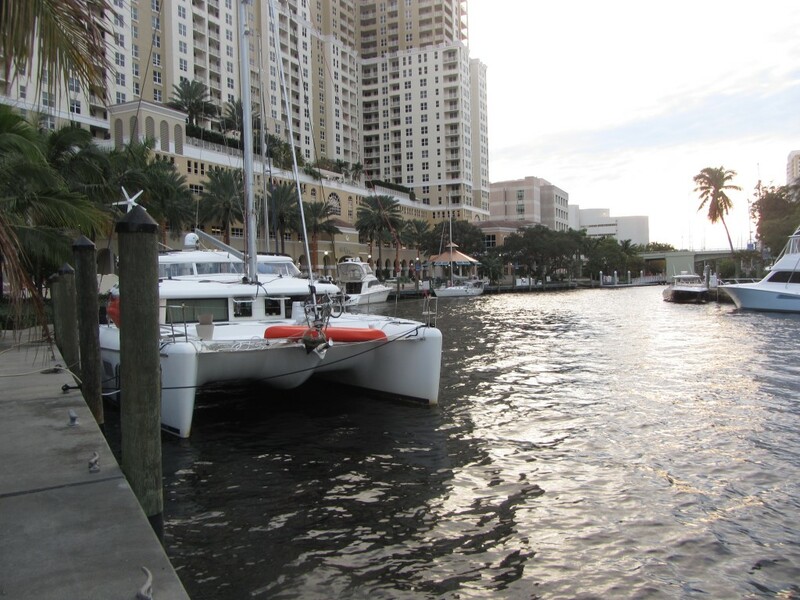 The scheduler did not like that plan and said we needed to be at a boatyard in Ft. Lauderdale Monday morning at 10 am. Our plan was to be halfway to Bimini by then if the weather window was still open. We know for sure it won’t be on Tuesday. We are used to plans being changed due to weather or if something breaks on the boat. When it is a person’s fault, like a rigger scheduler or an insurance representative, that’s hard to take. 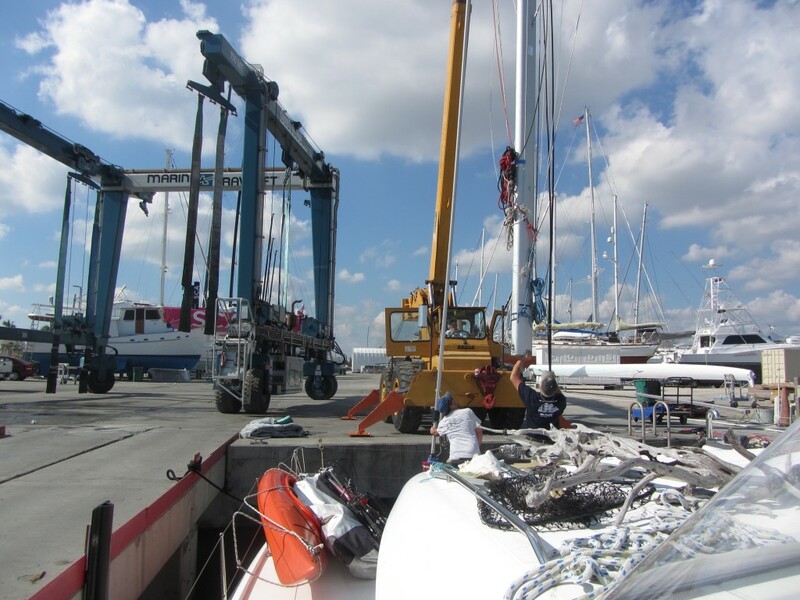 The two riggers who worked on the mast were excellent and did their job perfectly. 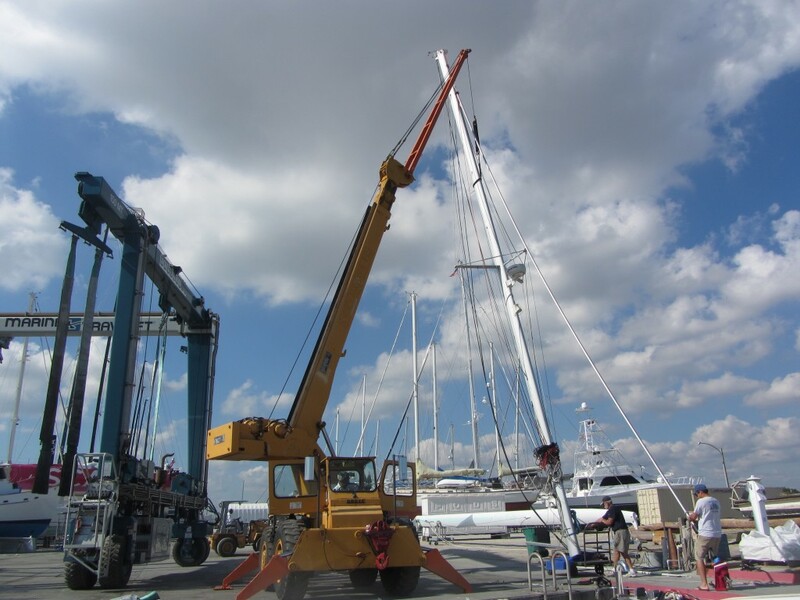 Below are some photos of the process of stepping a mast. With no other choice, we left Cracker Boy Boatyard and motored with our nice tall mast and no sails a short distance to the Lake Worth anchorage, which is apparently being dredged. We are now anchored at the edge of a mooring field. As soon as we dropped the anchor, it all came back to Sailor. Anchor down = dinghy down = Sailor gets to go ashore. We had a few other things to do first, but Sailor stuck to Mark like glue. Finally, he got his wish and happily jumped into the dinghy. 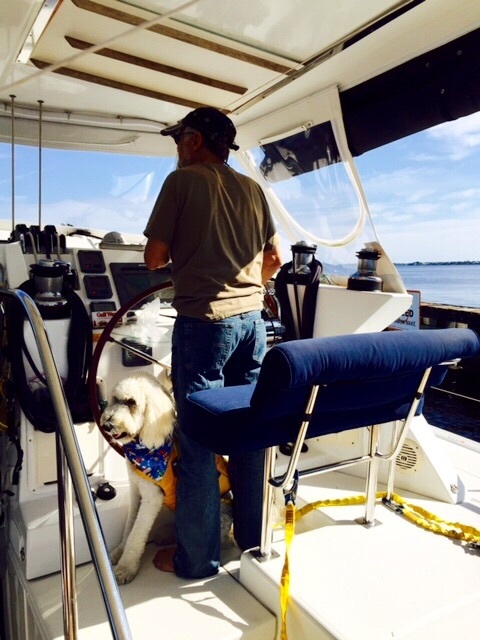 A tired Captain and an excited boat dog motored off to Peanut Island. It hasn’t been the best of days, but we can’t complain too much when this is our view. 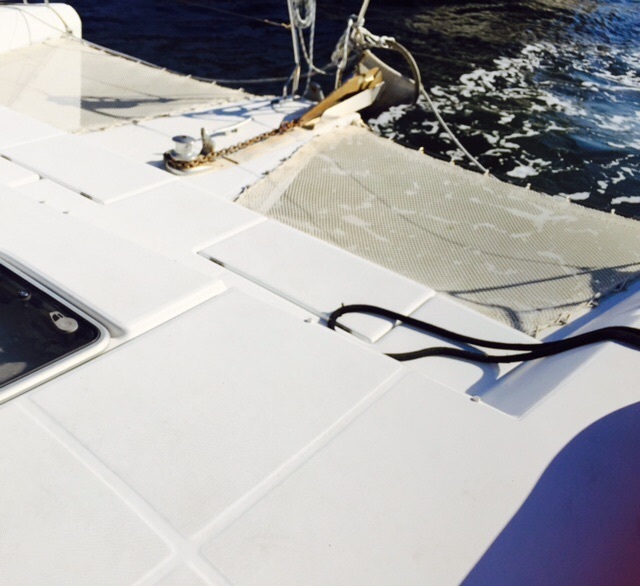 This entry was posted in Boat Maintenance, Sailing and tagged Boat Repairs, Cracker Boy on December 19, 2014 by Jan.
We left Sunset Bay Marina in Stuart at 1045 this morning, 12/18/14, and entered the ICW on our way to Lake Worth. Tomorrow we’ll have our mast stepped. We had it unstepped (removed) last June so we could get under a bridge in Stuart and go inland in case of a hurricane. It will be nice to be a sailboat again, although we saved a half hour traveling time today going under some of the low bridges. We went under nine bridges today. With our mast on, the top of which is 63 feet above the water line, we have to ask for most of them to be raised and this often involves a wait if they are on a schedule. A few are 65 foot fixed bridges. Our wind generator is the highest part of the boat now and it is 22 feet above the water. The bridges have markers in the water showing their current height depending on the tide. At the first one we came to the marker read 19 feet so we asked to have the bridge raised. The tender said his bridge was at 25 feet and we could easily go under it. We did and had about 5 feet between the wind generator and the bottom of the bridge. We found that other bridge markers were also inaccurate. Obviously, the bascule bridge heights are a guess. We are exhausted, mainly because we had to spend many, many hours during the last two weeks trying to get a “vacation waiver” for six months of our prescription medications. Almost all the people we talked with at our insurance companies didn’t have a clue what to do, even though we have done this before with the same insurance. We spent many hours on the phone, at the pharmacies and even went to our doctor’s office to get paper prescriptions when the ones they phoned in to the pharmacies were incorrect. Finally Tuesday evening we got our prescriptions filled and could get to the many other items on our “to do” list yesterday. It still took us several hours to get everything ready this morning. The weather is beautiful and the river is calm, but we’ve been rocked by a few fast boats passing us. They are usually small speed boats and maybe don’t realize when we rock, things fly off counters and shelves. No, that’s not true. They don’t care or at times even enjoy seeing us rock. I finally gave up grabbing things and put everything away like we do when we are sailing on the ocean. This boater behavior is very common on the ICW and inlets in South Florida. 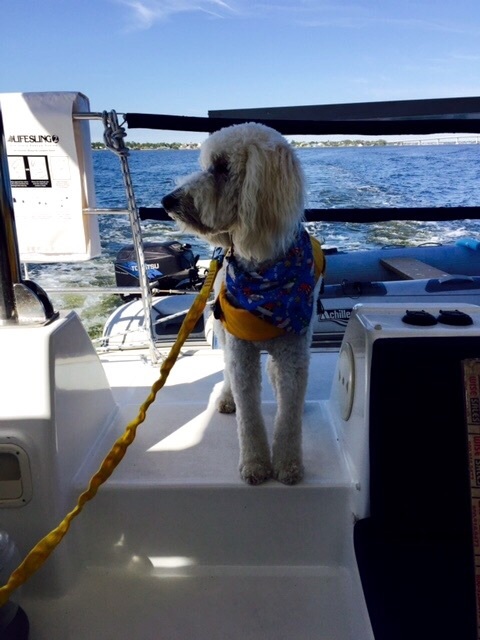 Sailor seems to have easily returned to his job as “first mate boat dog.” Our previous Goldendoodle Daisy, who was with us for five years on Seas the Day, never wanted to be inside when we were moving. She always settled in the cockpit under our feet at the helm and didn’t move until she realized we were stopping. 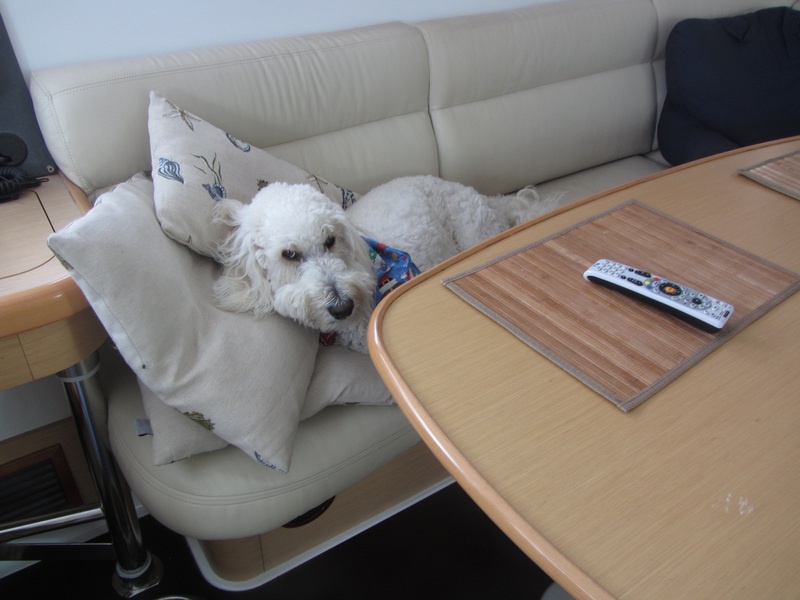 Sailor, on the other hand, is starting his second cruising season on the boat and he divides his time inside and outside. He spends part of his time on his bed under the salon table where I’m usually sitting. After awhile he goes outside to be under Mark’s feet. When that gets boring he walks around as far as his tether will let him go which is just a few feet. His nose is a little dirty in the pictures because he discovered the dirt in our newly purchased patio tomato plant. Can’t blame him since he doesn’t have a yard to dig in. We arrived in North Lake Worth at 1500. While going under the Parker Bridge we received a phone call from Old Port Cove Marina. We’ve been trying to get reservations there for days, but they were full. They offered us a tie up on their fuel dock for tonight, which we quickly accepted. 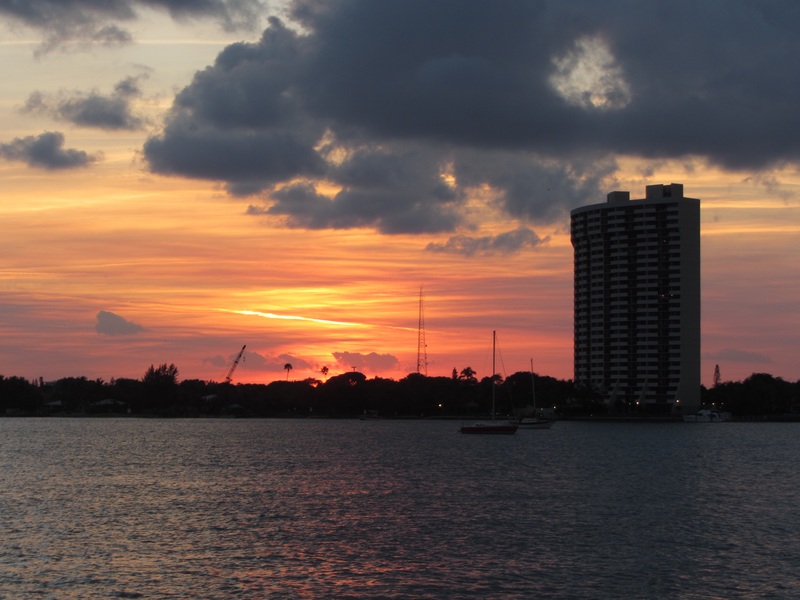 We love this marina and it will be our last until Bimini. 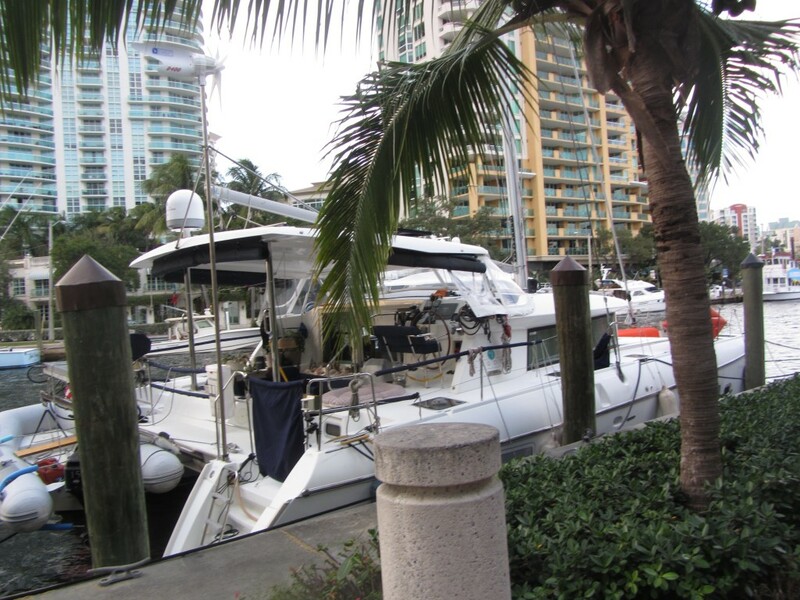 At $1.70 a ft in South Florida in the winter, that is very reasonable, especially at a high end marina. As an example, Tiger Woods docks his yacht here. The price is actually $2.00 a ft but they give a 15% discount if you have Boat US, which most boaters purchase for towing, kind of like AAA for cars. We even got a bottle of wine when we checked in, welcoming us to Old Port Cove, together with a card for free coffee, tea and soft drinks while we are here. An added benefit is that friends Fred and Karen (Southerly II) are here for the month and are located a dock away from us. We enjoyed a delicious dinner with them at Sandpiper’s Cove, the upscale marina restaurant, tonight. We figured we deserved a reward for all of our hard work the last few weeks. It is such a relief to have that behind us so we can be on our way to our 4th Bahamas cruise. This entry was posted in Boat Dog, Sailing and tagged Cracker Boy, ICW, Lake Worth, Old Port Cove Marina on December 19, 2014 by Jan.
We know that all cruising plans are written in sand, but we hope to leave Stuart in about a week to begin our fourth cruise to the Bahamas. Mark has a few jobs to finish and we have to start provisioning. Normally we would be ready to go by the beginning of November, but we were delayed due to the two knee replacement operations I had this fall. Briefly, my right knee was replaced on September 16 and the left knee was done on October 14. They were supposed to be replaced in the same week, but I had a reaction to the anesthesia during the second operation on September 19 and the surgery was postponed. Of course each surgery was followed by days in the hospital and weeks in rehab and then outpatient physical therapy. I am now ready to continue the exercises on my own so we can leave Stuart. Unfortunately, two surgeries sapped my energy for weeks and it’s frustrating for me to be so far behind in my part of the preparations. 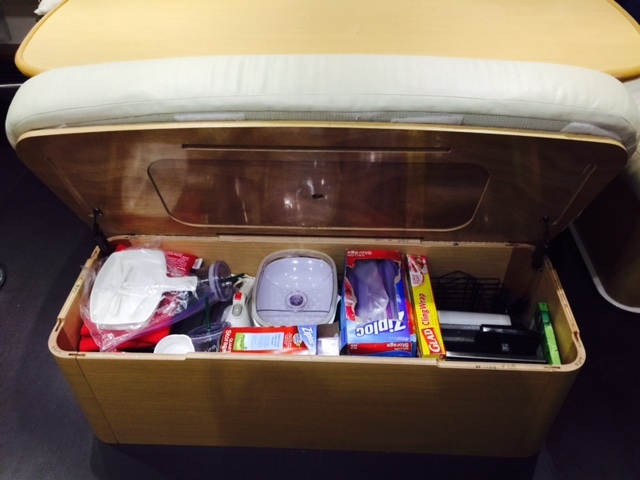 Normally I spend weeks provisioning and organizing everything on the boat in preparation for a cruise. 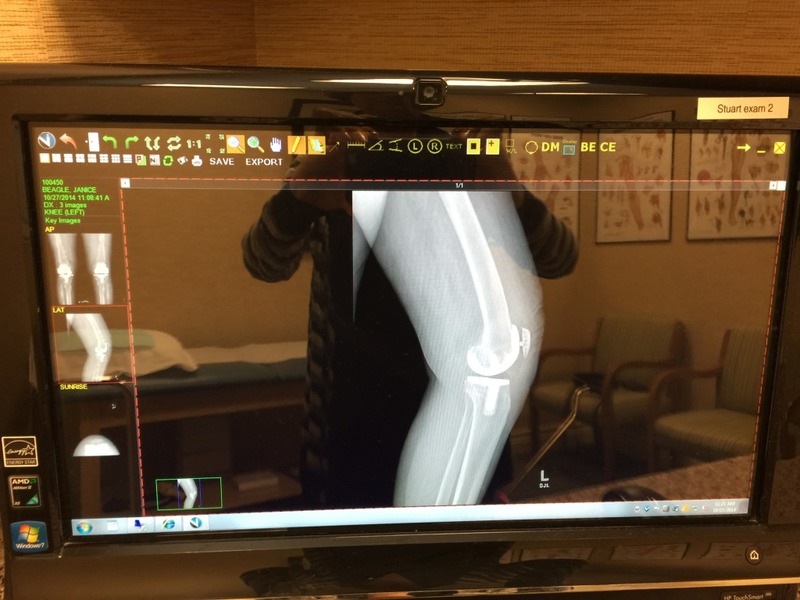 Below is a photo of an X-ray of my new knees. Luckily, Mark had plenty of energy and made changes to help me maneuver more easily on the boat until my knees healed and I got my balance back. 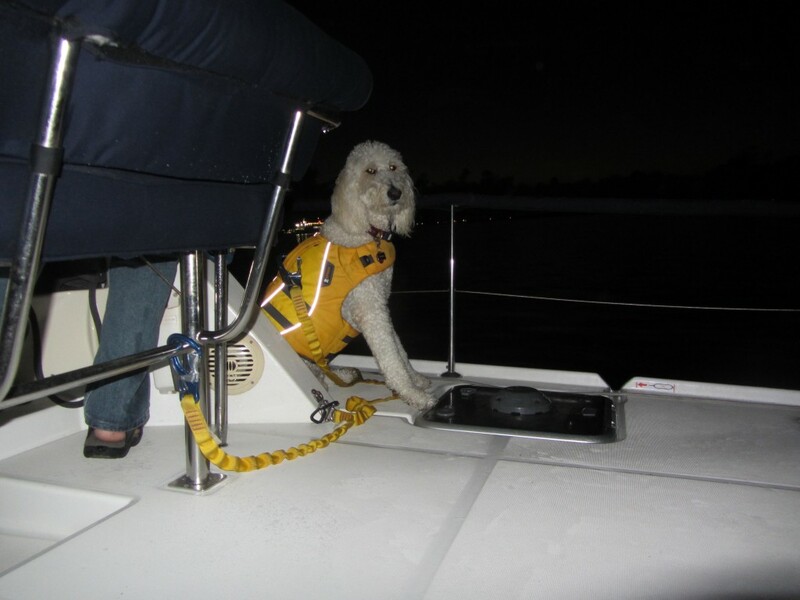 The most important addition was to help me get on and off the boat since we are not on a floating dock. He built a fantastic ramp with a boarding walkway that can be adjusted up and down with the tide. In the photo below, the walkway was not raised for the tide. Once adjusted it is level with the deck. Also, you can see the temporary wooden handrail he placed on the deck leading back to the cockpit. Mark also installed a folding teak seat in the master shower. It works great and while I don’t need it now, I think it will be useful to sit on when taking showers while we are anchored with rough seas or when sailing. 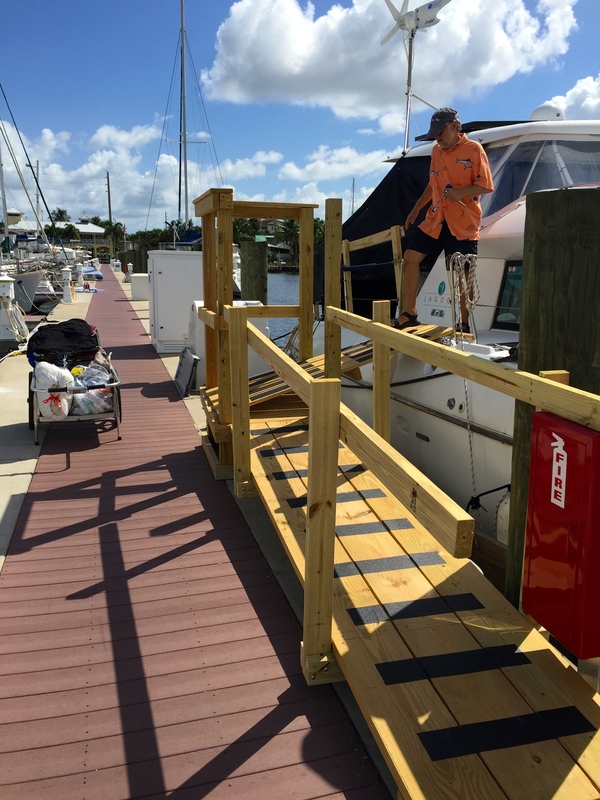 As always, we have made a number of changes and repairs to Seas the Day during the summer and fall while we have been on a dock at Sunset Bay Marina in Stuart, FL. 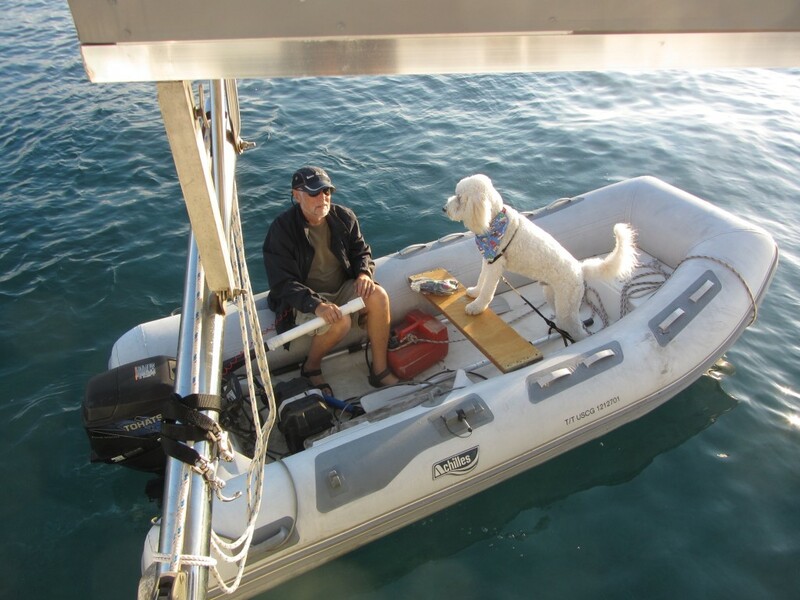 Our dinghy got a leak during the last month of our Bahamas cruise last year, so Mark found the hole and repaired it. He also added book shelves to the cabins (bedrooms), reworked the bookshelves in our office area so they could be used as a pantry, and added shelves to one of the hanging lockers also for food storage purposes. We are hoping all of these shelves will eliminate the need to use so many plastic bins to store our provisions while in the Bahamas. Mark repaired the sliding door in the salon so it opens more smoothly. He put hinges on a bench seat in the salon which has massive storage, but only had a small opening before to get at what was in there. In the photo the previous opening is shown on the wooden bench seat under the cushion. Before Mark made this hinged seat, we had to remove the cushion (held on by velcro) and reach through that small opening to get items. Now with the hinged bench seat we have easy access to everything stored in the bench and don’t have to remove the cushion to do it. Mark has also gotten all of the boat systems ready to go by performing regular maintenance. After years of complaining about the fuel consumption of our current generator, we purchased a Honda generator this fall. The Onan generator that came on the boat is huge (2100 kw) and was designed to work with the hybrid system we originally had on Seas the Day. It uses about two gallons of diesel per hour. The Honda generator is much more fuel efficient, using less than a gallon of gasoline per hour. While we don’t need to use our generator for power very often, due to our wind generator and five solar panels, there are times when we need it and the Honda will be much more cost effective. Hoping to leave Sunset Bay in about a week, it’s time to start shopping for food and other provisions. I use a lengthy spreadsheet to itemize what we have, what we need, and what we have to buy. Then lists are made and the shopping begins! Prices for food and other goods are more expensive in the Bahamas, so we will try to buy everything we need for the next five months before we leave. Also, some things aren’t available in the small stores we usually shop at when we visit the smaller settlements so if we don’t bring these items with us, we don’t have them until we return to the States. We’ll be buying food, paper products, dog food, everything that is in the medicine cabinet, cleaning products, etc. Basically, we need to stock up on everything we use. Of course we still buy perishables while we are in the Bahamas and usually we realize we have forgotten something. Mark and I both take prescription drugs, so we have to get special permission from Medicare to get six months of them, rather than the three months we can normally get. Due to my operations, this has been a very unusual season in Florida. I was either in the hospital or in rehab from September 16 until I came back to the boat on October 31, except for three days in between the two surgeries and rehab when I was home. During this time, Mark was usually visiting me, so he didn’t have the amount of time he usually has for repairs and new additions to the boat. Last year in the Bahamas we were somewhat limited because my knees started to hurt so much. We’re excited to be getting back to a somewhat normal life now. 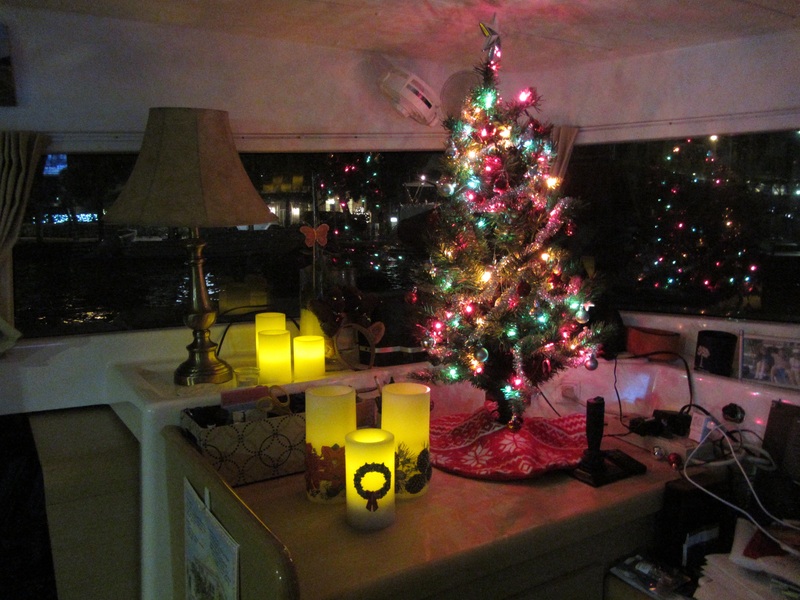 This entry was posted in Boat Maintenance, Living on a Boat, Sunset Bay Marina and tagged Boat Repairs, Generator, Provisioning on December 6, 2014 by Jan.